Were film protests cover for Libya terrorist attack? â€¢ Hundreds demonstrators stormed the US embassy in the capital Sana’a in protest at an anti-Islamic film following similar protests in Benghazi and Cairo. Security sources said 15 people were injured after police used teargas and gunfire to disperse the crowd. Windows to the embassy building were smashed, while cars and US flags were burned. â€¢ Yemen’s Yemen’s president Abd Rabbo Mansour Hadi apologised for the attack. He blamed those responsible as “demagogic groups”. The Yemeni embassy in Washington also condemned the attack. â€¢ State media says 29 people were injured and 12 people were arrests after a second night of protests against the film turned violent. Riot police repeatedly used teargas to disperse protesters near the US embassy building. â€¢ President Mohamed Morsi toughened his stance against the protests by condemning the attack on Libya that killed the American ambassador and vowing to protect foreign embassies in Cairo. Yesterday Morsi was slow to respond to the attack and then in his first remarks on the attacks urged the film makers to be sued. But speaking during a visit to the European Union in Brussels, he condemned “in the clearest terms” the attack in Benghazi. â€¢Â Barack Obama has vowed to hunt down the killers of US ambassador Chris Stevens and three other Americans during an assault on its mission in Benghazi as suspicion grew that the diplomat was the victim of an organised attack by an Islamist group.Â “Make no mistake: justice will be done,” Obama said at the White House.Â The FBI is being dispatched to Libya to help with the hunt, as well as 50 marines to reinforce the Tripoli embassy. Two US warships were reportedly heading towards the Libyan coast on Wednesday night. US surveillance drones are being redeployed to search for suspects among alleged jihadist camps in eastern Libya. â€¢Â The assault was a planned terrorist attack which used protests against an anti-Islamic film as cover, according to CNN’s sources. The fact that a rocket-propelled grenade was used is cited as evidence. â€¢ Syrian rebels and a pro-government group clashed near a Shia shrine on the outskirts of Damascus on Thursday, activists said, killing at least three people. The continuing violence came as new international envoy Lakhdar Brahimi arrived in Damascus for talks with senior members of the Assad regime. The US does not consider Egypt an ally “but we don’t consider them an enemy” either, President Obama has said in a TV interview, AP reports. The Libyan Muslims Brotherhood has condemned Tuesday attack on the embassy which led to the death of the US ambassador. “We vehemently condemn the attack,” the group said in a statement, but it issued a numbers of caveats. It said freedom of speech should be used to attack religions, and urged western governments to take tougher line on those who insult to Islam. Journalist Benjamin Wiacek, who witnessed the aftermath of the storming of the US embassy in Sana’a, says two groups of protesters were involved. Reuters, citing a security source, says 15 people were wounded, some from bullets and 12 people were arrested. Yemen’s president Abd Rabbo Mansour Hadi has condemned the attack. Those responsible are demagogic groups, who are unaware of the the Zionist forces, who have authored and published a film insulting to the Prophet Muhammad peace be upon him. 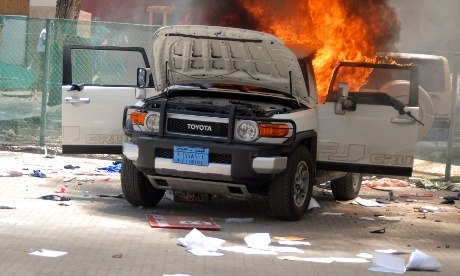 A car was set a light at the US embassy embassy in the Yemeni capital Sana’a. Photograph: Mohamed al-Sayaghi/ReutersThe video below shows protesters at the embassy this morning. Staff have been evacuated from the US consulate in Berlin because of a strange-smelling envelope, AP reports. Spokeswoman Ruth Bennett said the smell came from an envelope containing supporting materials for a visa application given to consular employees by the applicant in person Thursday morning. There were no reports of injuries and American and German authorities are now examining the contents. My first suggestion in this respect is that the makers of the film had deliberately set out to goad Muslims into just such violent and irrational reactions as we have seen in Egypt, Libya and elsewhere. It’s been tested many times before, and even if we can’t blame the penchant of certain influential political and ideological forces among us for ignorance and stupidity, we can still argue that those who would set out to trigger such responses are in possession of a very clear manual setting out how to do it, and the broad outlines of expected outcomes. America is hurtling towards presidential elections in which Barak Hussein Obama is running for a second term. For large sections of the American Christian right (closely allied to rightwing Zionism), Obama is, if not the anti-Christ, than at the very least a Muslim mole planted in the White House. He also suggests there is a desire “to tarnish, even to deny the very existence of an Arab spring”. There is little doubt that the provocateurs had counted on an irrational and violent reaction and they got it, possibly beyond their most optimistic expectations. The result is the same: the image of Arabs and Muslims as produced by the Arab spring is painted over with the old racist/Orientalist brush of the clash of civilisations. Sixteen people were injured in clashes between security forces and demonstrators in Tahrir Square, the Egypt Independent reports. The deputy director of Egyptâ€™s ambulance service, Ahmed al-Ansary, told state-run MENA news service that 11 people have been treated and their conditions have improved, it said. The Ministry of Interior says 30 were injured, and 12 protesters were arrested, according al-Jazeera’s Adam Makary. Cairo-based journalist Bel Trew is providing updates on the continuing violence. Despite reports of heavy gunfire, Yemen’s embassy in Washington no casualties were reported when protesters stormed the US embassy compound in Sana’a. An embassy statement emailed to Reuters said Yemen’s government condemned the attack by protesters angry at a film seen as insulting to Islam, adding security forces had restored order at the complex. Fortunately no casualties were reported from this chaotic incident. The government of Yemen will honour international obligations to ensure the safety of diplomats and will step up security presence around all foreign missions. About 500 protesters have gathered in Tehran outside the Swiss embassy which represents US interests in Iran, the Zurich-based Tages-Anzeiger newspaper is reporting (in German). The paper says a large police presence is protecting the embassy building. The demonstrators are said to be calling for maker of the anti-Muslim film to be killed but are also chanting the customary “Death to the US” and “Death to Israel” slogans. It’s all happening. The new international envoy Lakhdar Brahimi has arrived in Damascus for his first trip to the country since taking up the post. Brahimi will meet Syrian foreign minister Walid al-Moualem on Thursday and is due to meet President Bashar al-Assad for talks aimed at addressing the conflict. “During his visit to Syria, Brahimi will hold talks with the government and with representatives of the Syrian opposition and civil society,” his spokesman Ahmad Fawzi said in a statement. 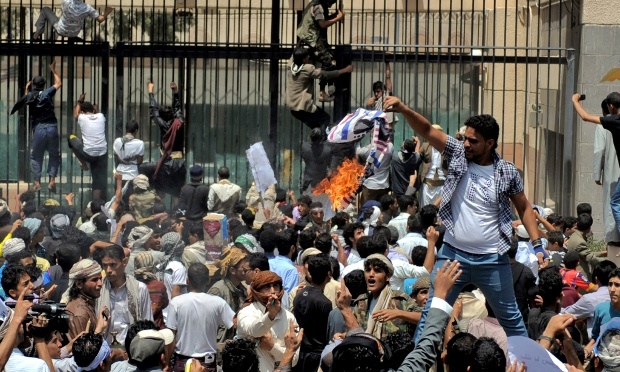 Yemeni protesters chanted “death to America” and burned the US flag, as hundreds stormed the US Embassy compound in the capital Sana’a AP reports. Before storming the grounds, demonstrators removed the embassy’s sign on the outer wall, set tires ablaze and pelted the compound with rocks. Yemeni security forces who rushed to the scene fired in the air and used tear gas to disperse the demonstrators and were eventually able to drive them out of the compound. It was not immediately clear whether anyone was inside the embassy at the time of the attack. Ten to 15 demonstrators managed to break into the US embassy in Sanaâ€™a after a call to protest by a radical Yemeni cleric, according to Sanaâ€™a based journalist Nasser Araybee. There was very heavy gunfire during the incident he said in a phone interview with the Guardian. Two cars in the embassy compound were burnt and protesters tried to tear down the US flag, Araybee said. Smoke could be seen from every where. [Initially] we thought it was the building but it was cars that were burnt. There is no one in building now, and security is very heavy. The firing has almost seized. There are hundreds of protesters outside the building, he added. The mood is very very bad. The area is very afraid because of the firing. Many residents told me that children were horrified, because of what they heard. After the saw the smoke a lot of them started to move. Now it is getting quieter and quieter. He claimed the protests came after Sheikh Abd al-Majid al-Zindani, a religious leader accused by the US of supporting terrorism, called for a protest yesterday. Zindani called on Yemenis to follow the example of protesters in Libya and Egypt, Araybee said. Zindani, 70, is one of the most influential religious figures in Yemen as well as a prominent member of the conservative-Islamist Islah party. In 2004 he was listed by the US Treasury as a “specially designated global terrorist”. Iman University and at one point claimed to have discovered a cure for Aids. Although the Islamophobic film appears to have been the trigger for today’s protest, anti-American sentiment in Yemen is more broadly-based than in Libya. Continuing drone strikes aimed at terrorists have killed numerous innocent civilians and the US ambassador, Gerald Feierstein, is an especially unpopular figure. His behaviour has been criticised as heavy-handed and because of his political influence he is sometimes described as Yemen’s acting president. Protesters have forced their way into the compound of the US embassy in the Yemeni capital, Sana’a, according to numerous reports. 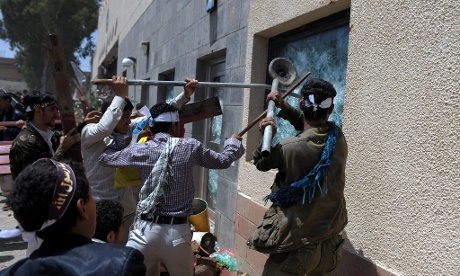 Demonstrators smashed windows of the security offices outside the embassy before breaking through the main gate of the heavily fortified compound in eastern Sanaa. Security guards opened fire and there were reports of casualties on both sides but no details were immediately available. AP says that before storming the embassy compound, the demonstrators removed the embassy’s sign on the outer wall and set tyres alight. Once inside the compound, they brought down the US flag and burned it. AP adds that the protesters were on the embassy’s grounds but did not enter the building housing the offices. The Yemen Times reported a few minutes ago that US embassy staff were being moved to a safer location. Mohammed Albasha, Yemen’s spokesman in Washington, has tweeted that additional security forces have been sent and the situation is now under control. Egyptian president Mohamed Morsi has toughened his stance against the protests at the US embassy in Cairo. Expressing opinion, freedom to protest and announcing positions is guaranteed but without assaulting private or public property, diplomatic missions or embassies. He also pledged to protect foreigners and condemned the killing of the US envoy in Libya. Morsi’s initial response to the attack was to stay silent for 24 hours. They [Morsi and the Muslim Brotherhood] seem far more concerned at the moment with their domestic political interest in protecting their right flank against Salafi outbidding than with behaving like the governing party of a state. Then Morsi issued a statement condemning the anti-Islamic film and urging the US to sue the film makers. In his first statement on the issue he also failed to condemn the killing of Chris Stevens. Morsi will be “roasted by the Western media”, as he is due to travel to Brussels and Rome today, predicted Egyptian blogger Zeinobia. The White House says President Barack Obama has called the presidents of Libya and Egypt and urged them to continue working with the United States to ensure the safety of diplomatic personnel, AP reports. Obama thanked Libyan President Mohamed Magariaf for his condolences over the deaths of US ambassador Chris Stevens and three other state department officers during an assault on the U.S. consulate in Benghazi Tuesday. The White House says the two leaders agreed to work together to bring the attackers to justice. During a second call, Egyptian President Mohammed Morsi promised Egypt “would honor its obligation to ensure the safety of American personnel,” the White House said. Security outside the US embassy in Cairo appears to have been stepped up after a second night of protests. Welcome to Middle East Live where we will continue to focus on the aftermath of Tuesday’s attack on the US consulate in Benghazi and continuing protests in Cairo over an anti-Islamic film. â€¢ Barack Obama has vowed to hunt down the killers of US ambassador Chris Stevens and three other Americans during an assault on its mission in Benghazi as suspicion grew that the diplomat was the victim of an organised attack by an Islamist group.Â “Make no mistake: justice will be done,” Obama said at the White House.Â The FBI is being dispatched to Libya to help with the hunt, as well as 50 marines to reinforce the Tripoli embassy. Two US warships were reportedly heading towards the Libyan coast on Wednesday night. US surveillance drones are being redeployed to search for suspects among alleged jihadist camps in eastern Libya. â€¢ The assault was planned terrorist attack which used protests against an anti-Islamic film as cover, according to CNN’s sources. The fact that a rocket-propelled grenade was used is cited as evidence. Sources tracking militant Islamist groups in eastern Libya say a pro-al Qaida group responsible for a previous armed assault on the Benghazi consulate is the chief suspect. A senior defence official told CNN the drones would be part of “a stepped-up, more focused search” for a particular insurgent cell that may have been behind the killings. â€¢ There are competing theories among US officials about whether the attack was timed to coincide with 9/11 or whether it was opportunistic, writes Chris McGreal in Washington. Some officials drew attention to the scale of the assault, ostensibly over an anti-Muslim film, compared to an earlier protest in Cairo. [But] senior administration officials also said they believe that the consulate building, which was burned and looted, was the intended target, and that Stevens was an accidental victim. The attackers are unlikely to have known the ambassador was visiting from Tripoli. â€¢Â Barack Obama has stepped into the political row over Republican presidential candidate Mitt Romney’s ill-judged response to the Benghazi consulate attack.Â Romney faced heavy criticism from across the political spectrum for statements issued on Tuesday evening and repeated at a press conference on Wednesday morning in which he accused the Obama administration of being too ready to apologise for American values. â€¢ ChrisÂ Stevens was in many ways the model American diplomat, committed, idealistic, and willing to take risks, according to the LA Times. Stevens had a yearning to mingle with Arabs to get a street level view of events, and he sometimes chafed about the post-September 11 security measures that sometimes prevented diplomats from reaching far into the hinterland. â€¢ The hunt for the maker of the anti-Islamic video that inflamed mayhem in Egypt and Libya has led to a Californian Coptic Christian convicted of financial crimes.Â Nakoula Basseley Nakoula, 55, who lives outside Los Angeles, confirmed he managed and provided logistics for The Innocence of Muslims and that heÂ considered Islam a cancer and that the film was intended to be a provocative political statement assailing the religion.Â He denied being Sam Bacile, the pseudonym for the video’s purportedly Israeli Jewish writer and director, but AP said the cellphone number it called for a telephone interview with Bacile on Tuesday matched Nakoula’s address. â€¢ The anti-Islamic film which was initially thought to have sparked the attack on the US consulate in BenghaziÂ has caused uproar across the Muslim world. Protesters took to the streets in some countries, US citizens were warned to keep a low profile and public condemnations of the film were issued. â€¢Â A second night of protest against the film turned violent in Cairo as clashes erupted between demonstrators and police in the early hours of Thursday in Tahrir Square, the Egypt Independent reports. Police vehicles fired teargas at protesters who were banging stones on metal to make noise. Stones were hurled from both sides.Â An anonymous protester said he demands that the US ambassador to Egypt be expelled and measures against the screening of the film to be taken. â€¢ President Mohamed Morsi called on the Egyptian embassy in Washington to take legal action against the producers of the â€œInnocence of Muslimsâ€ film. HisÂ statement came nearly a full day after the first attack took place. â€¢ TheÂ tepid response from the Egyptian government to the first assault gave officials in Washington â€” already troubled by the direction of President Mohamed Morsiâ€™s new Islamist government â€” further cause for concern, according to the New York Times.Â Several foreign policy experts said they worried that Morsi was putting appeasement of his countryâ€™s Islamist population ahead of national security, it said.